Scroll down to discover how refugee movements have changed in Somalia. Due to ongoing internal conflicts, Somalia is a major country of origin. Somalia is widely seen as a failed state. Due to their geographical proximity to Yemen, the de facto autonomous regions of Puntland and Somaliland are important transit regions for refugees from the Great Horn of Africa. It is assumed that these regions also host many undocumented migrants. In 1989, the refugee population from Somalia was 400,000. Until 1992, this number increased to 800,000. This was due to the beginning of the Somali Civil War. Until 2005, the refugee population from Somalia steadily decreased to 400,000 again. Even after the fall of the Barre regime in 1991, Somali refugee numbers were the highest in the Great Horn of Africa region. This was due to the ongoing Somali Civil War and the resulting state failure. Between 2006 and 2013, the Somali refugee population increased from 450,000 to 1.1 million due to ongoing conflict and natural disasters. The 1.1 million Somali refugees obtained asylum in Kenya (480,000), Ethiopia (240,000), Yemen (230,000) and other countries (150,000). The first peak in Somali refugee numbers was caused by a civil war between three warring parties: The Somali National Movement (SNM) from the Somali north, the United Somali Congress (USC) from the south of the country and the governing Barre regime. In Ethiopia, Camp Hartisheik became the world's largest refugee camp for hosting Somali refugees. The winning anti-Barre movements SNM and USC could not agree on any follow-up government. As a result, the state of Somalia gradually decayed into regions dominated by clans and warlords. Between 1992 and 1995, the United Nations intervened through the UNOSOM missions. In 1995 however, UNOSOM had to withdraw from the country due to the severity of the fighting. From then on, Somalia was regarded as a failed state. The SNM declared the north of the country independent Somaliland. The USC split up due to internal differences. In 1998, the Puntland region in the northeast of the country was proclaimed an autonomous part of Somalia. In 2007, the Maakhir region was declared an independent part of the border region between Puntland and Somaliland. In the meantime, loyalists of the former Barre regime fought for the reinstallation of the Barre regime from the south of the country. A Transitional Government, convened in 2000, failed due to the resistance of various powerful clans. For a short time, the Union of Islamic Courts, an association of Sharia Courts, was able to take over Mogadishu and various parts of the country. When the Union called for the conquest of Ogaden, a region belonging to Ethiopia and mainly inhabited by Somalis, the Ethiopian government decided to intervene at the end of 2006. Ethiopia declared war on the Union. Soon, the Ethiopian troops were able to expel the Union from Mogadishu and the 2000 Transitional Government was installed. Nevertheless, there was an open war between the Transitional Government, its allies and various enemy groups. One of these groups was the Islamist organization al-Shabaab, which emerged from the Union. To this day, al-Shabaab remains active in the region, perpetrating numerous attacks on government officials, foreign troops and the civilian population. 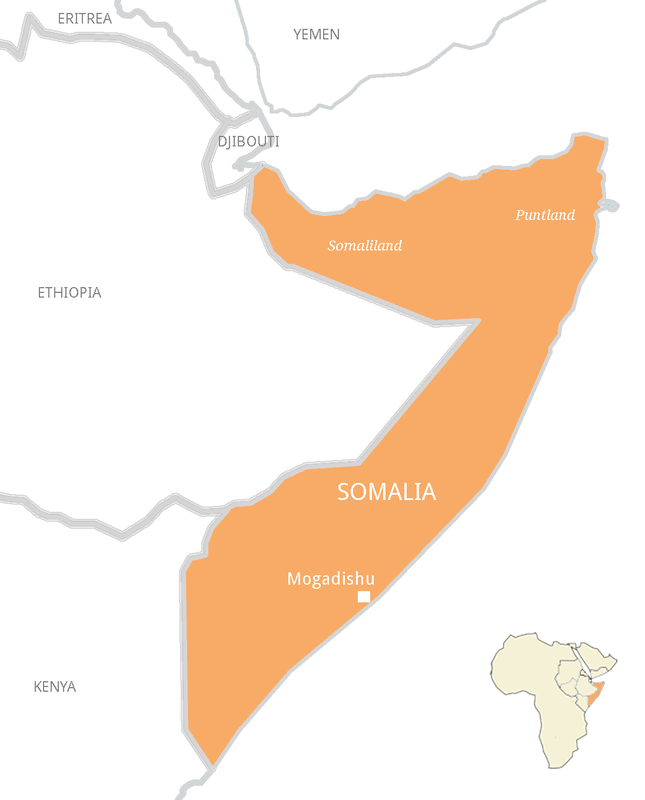 In August 2012, the Transitional Government was replaced by the new constitution of the Somali Parliament, and Somalia was transformed into a Federal Republic. Since then, several federal Somali states have been formally defined by the Parliament's deputies. Despite the fact that for the first time in many years, Somalia has a formal government, the political situation in the country remains precarious and volatile. Also, many development agencies active in the region have highlighted the repeated occurrence of natural disasters, such as seasonal drought or floods, which are threatening the life of millions of Somalis.